CounterBalance allows management personnel to develop a custom system tailored to the specific needs of an operation. 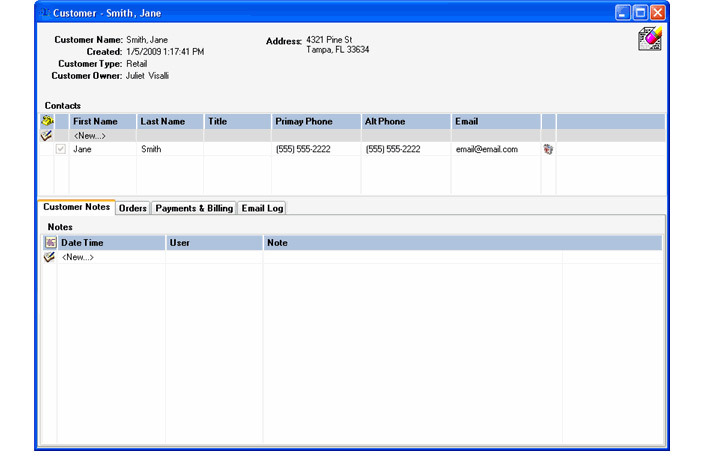 Develop custom process flows, payment methods, forms, access control, notification and reporting. The CounterBalance platform is as close as you will get to developing the application yourself. All of this done through common and simple user interfaces within the CounterBalance System. Everything needed to customize and maintain your CounterBalance System can be accomplished by you the end user. CounterBalance allows a business to easily track vital information to execute and maintain a profitable sale cycle and stream line production efforts. The product will track a sale from the initial lead entry to the close state while collecting vital data for advertising, sales control, fabrication and installation production. 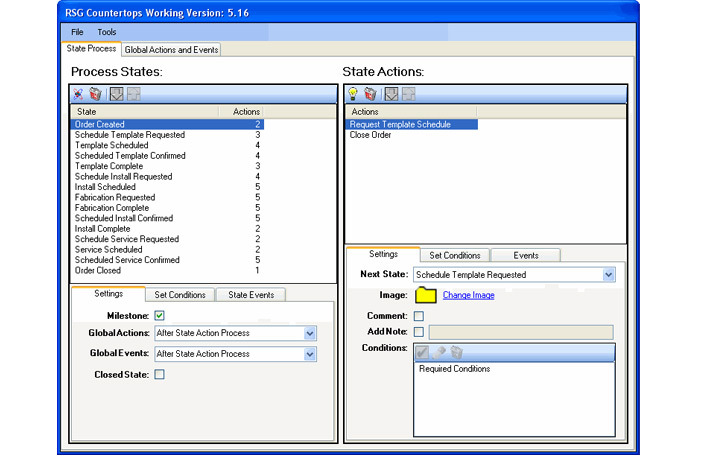 During this cycle the user can visually see the current flow states. CounterBalance not only handles the lead and customer interaction in a well structured and consistent model but also manages the inventory aspects of those sales. 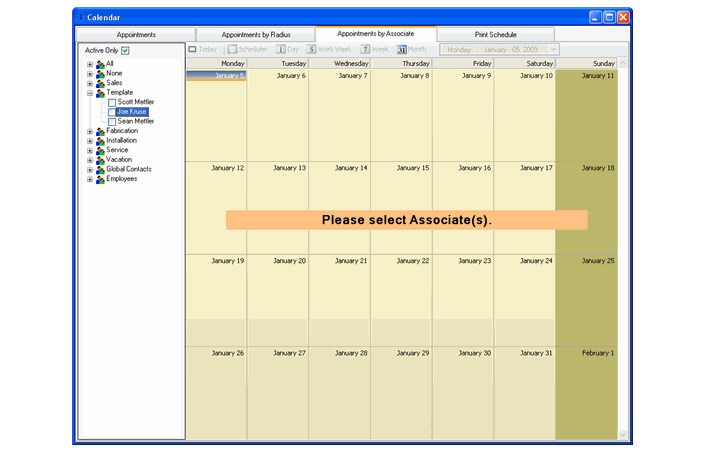 CounterBalance can also handle all of your scheduling needs for sales appointments, templates, installs, services, truck usage, vacation or anything else you would like to track in a central managed calendar without the need of any external software. CounterBalance has been custom designed by people working in the counter top industry to cover all the specific needs of a granite counter top business. For example custom top type setup for multiple materials, different edge types, sink models and faucets all with their own price structure as the user sees fit. 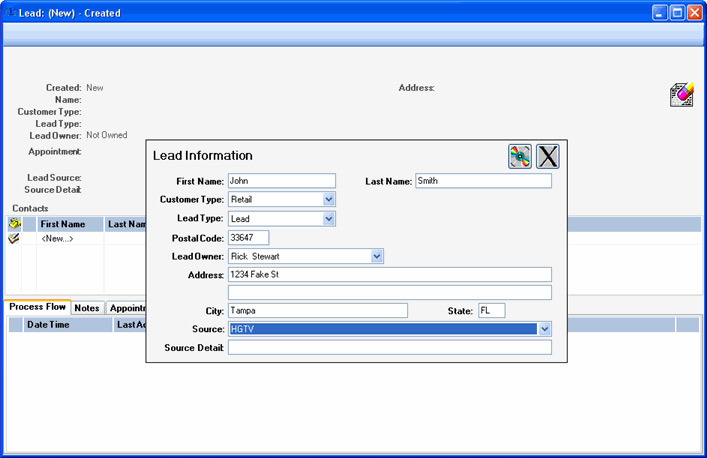 CounterBalance has customized Form Letter capabilities that allow users to produce common letters for a selected set of leads, customers or orders. This makes the process of follow up to potential customers or thank you letters to your latest installs a breeze. CounterBalance has many more features currently offered in the product. Q:Where can I find a CounterBalance Demo Server for my Test Drive? A:We currently offer a hosted version of the CounterBalance product for viewing and exploration. Here you can have hands on experience with a CounterBalance System without the need of a server installation and setup. The sample system is for a generic Solid Surface operation but illustrates many of the key features you will find in a CounterBalance system. Because this is a sample demo the information amount and activity may very from time to time. Please contact support@nexphaze.com for a one on one phone walkthrough of any of the features. Please visit our CounterBalance Demo section here. Q:What do I need to run CounterBalance Server? A:The CounterBalance system uses MS SQL Database backend for information storage. 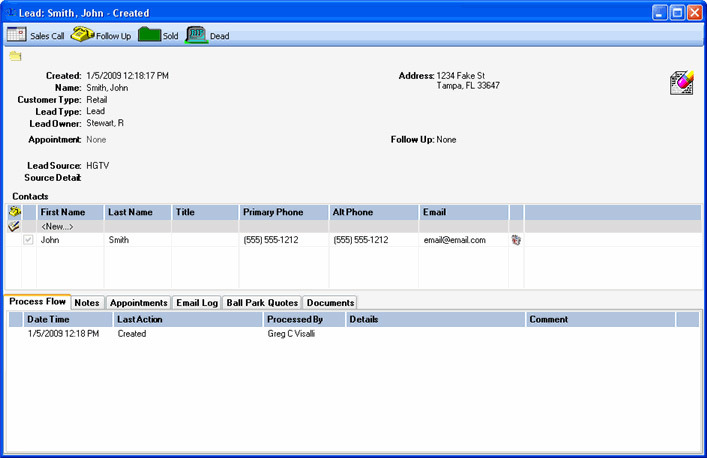 The CounterBalance Server Manager will install MS SQL Express (Free) on your designated CounterBalance database server. 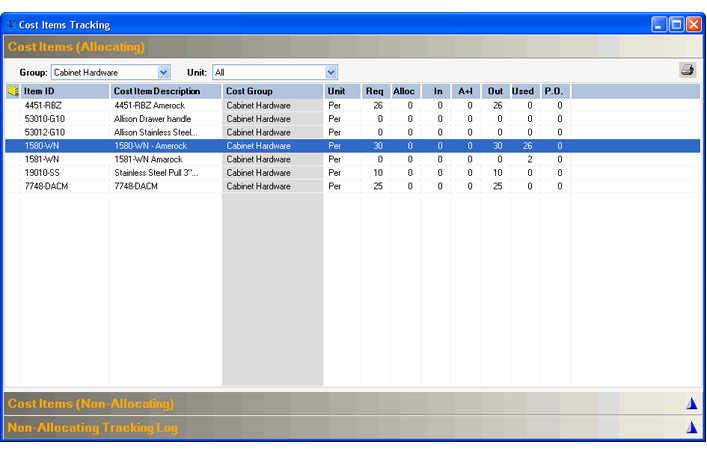 The CounterBalance User Application can be installed on any user machines which have network connectivity to your database server. Secure remote access can be accomplished via VPN connections. A simple CounterBalance setup will have both the CounterBalance Server Manager and the User Client installed on the same machine. Application machine specifics may differ please see Downloads here. Q:Is CounterBalance a hosted Solution? Q:Will CounterBalance work for my (any) operation? A:The CounterBalance system may be setup for any operation by defining the custom products, services and process control for that operation. The System can be setup using a predefined CounterBalance import file or setup clean with all of your custom information. Cost Items, Products and Services can be imported and updated via vendor spreedsheets. 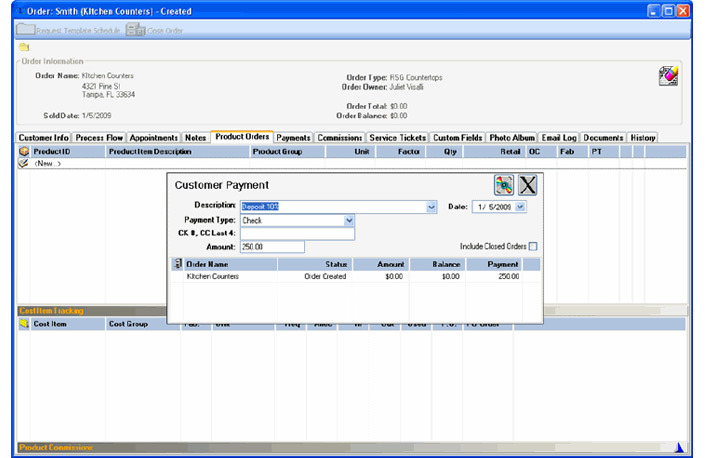 Quickly add new items or update existing prices directly from your vendor provide data sheets. Define your own process for handling Leads and Customers. Custom defined steps by you for scheduling, forms generations, payments and inventory control. Q:Can CounterBalance be accessed from anywhere? A:CounterBalance only requires a network connection to the Database Server. Within a typical a location this is already setup. For remote connections Nexphaze recommends using a VPN for data security. Q:Where can I get help and support for CounterBalance? The CounterBalance product may now be sampled online with our CounterBalance Demo server. The CounterBalance hosted server is a full featured server that may be used for exploring and testing the CounterBalance System. The demo server will be reset from time to time to ensure a clean and useful experience. This demo server is currently set for a sample Solid Surface operation. This is only one example of the type of product and service operation the CounterBalance Platform may be used for. Please download and install the CounterBalance User Application. 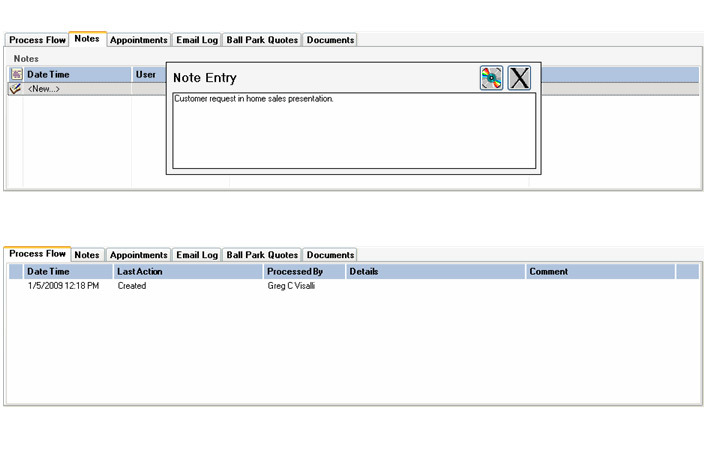 Once your CounterBalance User Application is installed you will be prompted to connect to the Demo Server. Once connected please create a demo User Login. Once you have created your demo login and logged into CounterBalance feel free to explorer the CounterBalance System. Sample creating leads, customer and orders. Checkout the Product and Cost Item management for products and inventory. Please contact support if you have questions on any part of the system or demo. Please keep your sample data clean and respectable for other demo users. 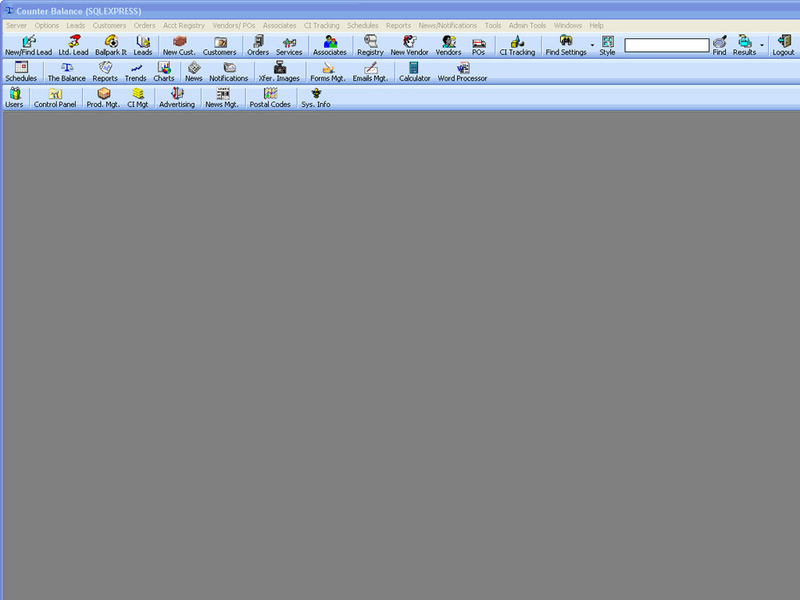 The demo database may be reset to clear examples for other user interaction.